Recently, I’ve had several people ask me about my favorite natural mascaras, so I figured it was time to finally reveal the notes I’ve been keeping in my Gmail drafts (yes, that’s how I roll) and share my ultimate guide to natural mascaras to date. This will be an ever-growing post, so bookmark this baby to see the various natural mascaras I’ve tried, reviewed and repurchased. A Note About My Eyes: I’ve said this before, but I have short, stick-straight, half-Asian eyelashes that point straight down. My Shu Uemura eyelash curler is my best friend, and I’m after a mascara that can 1) lengthen; 2) thicken; 3) hold a curl; and 4) not smudge on my oily skin. Another Note: This little asterisk* indicates I received the natural mascara as a PR sample. So, yes, free stuff as well as paid-for-on-my-own stuff gets honest feedback around here! While it didn’t smudge (hallelujah! ), 100% Pure’s Fruit Pigmented Mascara felt too dry and flaked off on me after a few hours. It’s extremely natural looking, too, meaning no real length or thickness added. If your lashes are already beautiful, then 1) I hate you and 2) you may want to try this (who knows if it will flake on you). Alima Pure’s Natural Definition Mascara smudges within a few hours of applying. The lengthening power is nice, but the black spots are not. Benecos’ Maximum Volume Mascara hass an extremely wet formula, which leads to crazy smudging within an hour of applying — even if I’m patient and let it dry completely before doing my daily acrobatics workout (this is a joke). For the hour that it’s not smudging, it lengthens my lashes but doesn’t do much to hold a curl or thicken. This is very common for Asian lashes — we need drier formulas that don’t weigh us back down. 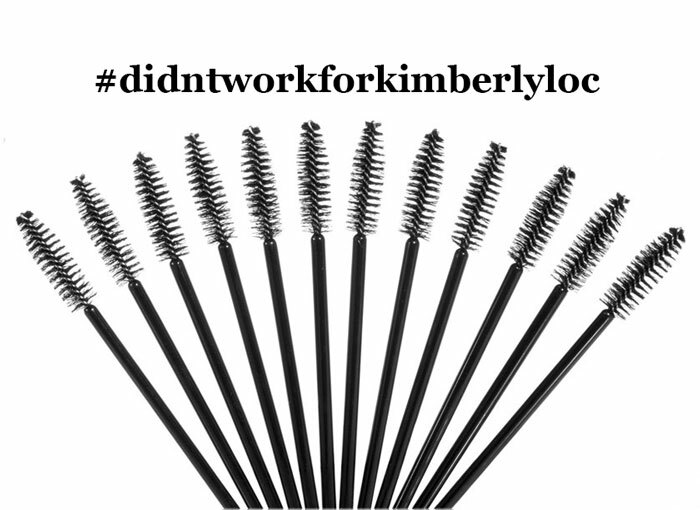 Any wet-formula mascara is going to be an epic fail for us. Another natural mascara that’s easily available at my local Whole Foods, Dr. Hauschka’s Mascara smudges on me and offers zero lift or va-va-voom factor. This mascara delivers the “your lashes but better” look, but didn’t do much for holding a curl or thickening my lashes. It also smeared a bit by the end of the work day. I wanted to love this mascara. It fattened up my lashes a bit, offering volume and length, but unfortunately, it budged on my by the end of the work day. I tried Honeybee Naturals a looooong time ago (back in my magazine editor days, circa 2008-ish), so unless there’s been a new formulation since then, this baby smudged on me, too. Ilia Beauty Mascara in Nightfall is the newest mascara in my collection (see it in this Instagram), and while I’m impressed with how long-lasting it is and appreciate that it doesn’t clump or smudge, I wish it thickened my lashes and held a curl a bit better. I have to re-curl my lashes a few hours after applying this to re-lock the shape. I will say that it has a better-than-natural look about it, so this could be an option for those days when your eye makeup is a little more subtle and you’re really doing up your lips. I could see myself possibly repurchasing this, but for $26, I’d expect it to meet all my needs. I can’t tell if Donna from Jing Ai still sells her Eye Paint Mascara (I saw it for sale on a different site, but not Jing Ai’s), but alas, this super-inky natural mascara smudged like crazy on me and offered very little volume. I wanted to love this natural mascara because, I mean, it’s Josie Maran, just look at her, and it’s readily available at my local Sephora, but also it smudges like whoa on my oily skin. While this mascara didn’t smudge on me, it didn’t do anything at all for my naturally straight, downward-pointing lashes. After applying it to freshly curled lashes, it actually weighed them down and didn’t help at all in the volumizing department. This is more of a “your-lashes-but-kind-of-darker” mascara. When I’m going for a no-makeup, natural look, I just skip mascara and only curl my lashes. Less work. Like its sister formula below, this natural mascara from Physician’s Fornula isn’t too bad overall, but it dries out very quickly and flakes a bit. Too bad because this could have been a winner (especially at such an affordable price). Oh the balance between being a not-too-wet and not-too-dry mascara! You can read my in-depth review of this natural mascara, but the short version is that this budget-friendly natural mascara from Physician’s Formulas is clumpy and smudges by the end of the day. It’s not too bad overall (to last all day without smudging is quite a feat! ), but it’s not a repurchase for me. This natural mascara from Pür Minerals lengthens and doesn’t smudge, but it doesn’t fatten up my lashes unless it’s doing so by making them extremely clumpy. Though this natural mascara isn’t a repurchase for me, I’d absolutely recommend it to anyone who’s looking for a mascara that will naturally darken and lengthen their lashes. Because I prefer more thickening and dramatic lashes, this formula wasn’t a fit. If I was already blessed with naturally dark and thick lashes and just needed a natural mascara to add a little bit of oomph, this would be the one. It doesn’t clump, flake or make the lashes stick together. In fact, the applicator delivered the most even, separated coating of mascara either. I just wish it was a more thickening, dramatic formula! I’m a bit on the fence when it comes to RMS Beauty’s Mascara. It didn’t flake or smudge, but it didn’t give me that “Wow!” look; it’s just a nice, clean, natural-looking mascara that’s comparable to Ilia Beauty’s. Quite honestly, I guess I could just copy and paste my Ilia review and stick it here (I mean, even the packaging is quite similar!). I just expect a bit more from a $28 natural mascara. I’m going to keep it in my arsenal and continue to play with it, perhaps even layering it over or under Ilia’s to see if I can create a texture and hold that I like. This mascara is almost perfect — long, inky lashes with an oooomph of volume — but unfortunately, it is very clumpy when applied to my lashes. My first application of this vegan-friendly mascara was OK. I got length and jet black lashes, but was a tiny bit clumpy. The subsequent applications yielded clumpier and clumpier lashes. Such a disappointment because this formula is amazingly voluminous and holds a curl like none other. Hopefully it will be reformulated to fit my eyes. Until then, I have a few other Tarte favorites to reference instead. On a whim, I decided to try this updated version of my beloved Lights, Camera, Lashes to see how Tarte could improve upon its already-winning formula. Sadly, I was disappointed not in the formula, but in the packaging of this mascara. First, the mascara tube is awkward to hold. There’s extra material on the edges of the wand handle (the bit of fabric outside the stitching — zoom in on the picture on the Sephora product page) that makes it super-cumbersome to hold and even more annoying to brush your lashes. Second, Tarte has redesigned the brush for this mascara so that there’s a variety of shorter and longer bristles on each side, which is supposed to better deliver product without allowing it to clump, but Tarte directs you to brush the mascara on in such a way that you’re constantly rotating the wand in a basically impossible way (see complaint No. 1 about the excessive packaging design). If you didn’t get the application motion down pat, then the mascara is rendered useless and your lashes sad and short. Instead of this mascara, try the two I mention in my repurchase list below! At first application, I thought BareMinerals Flawless Definition Mascara would be another “natural look” mascara. Not so. It’s extremely buildable yet doesn’t clump thanks to all the fine little lash separators in the wand. BareMinerals Flawless Definition Mascara really does lengthen and lift the lashes, and when applied in even coats, gives you that bit of thick, dramatic fullness. Available in black, brown black and navy, Jane Iredale’s PureLash Lengthening Mascara delivers long and full lashes with just two thin coats. Think “your lashes but longer” with this mascara, as it’s totally natural looking, but with a slight boost in fullness and a big boost in length. While I usually go for mascaras that add a lot of thickness, I like this mascara for when I’m going for a “no makeup” makeup look. My lashes are long and hold a curl, but aren’t over-the-top and flashy. This is a great mascara for everyday wear, or for when you’re playing up your lips more and want some subtle glamour on your eyes. I am beyond impressed with this mascara. After reading several different reviews, I thought it would surely flake on me and give me raccoon eyes. Wow, was I pleasantly surprised! Kjaer Weis makes one of the best eco-luxe mascaras out there. My lashes were darkened, lengthened, lightly thickened and fully defined with just two coats of this organic mascara. It never smudged or flaked on me (which is the usual with my oily skin — and oily eyelids!). It lasted all day (a typical 9-hour work day and commute) without one mishap. Though, clearly, it’s what’s on the inside that counts, I also love Kjaer Weis’ chic packaging that’s refillable — smart, smart, smart. The skeptic in me didn’t have high expectations for this natural mascara, but after so many disappointments, can you blame me? My introduction to Lily Lolo, though, has been nothing short of fantastic. The new black vegan mascara easily rivals my beloved BareMinerals and Tarte. It holds a curl, lengthens, defines and even amps up the volume of my stick-straight lashes. Even more impressive for a new-ish formula, Lily Lolo natural mascara didn’t flake on me until, oh, 10 hours of wear. That’s a crazy feat! This is a definite repurchase, and I’m looking forward to trying more from Lily Lolo makeup. With its dry formula and long, medium-thick wand, Living Nature’s Thickening Mascara is a bit unassuming — until that first swipe onto your lashes. Wiggling from root to tip, I was able to get thick, luscious lashes that weren’t over the top yet were extremely flirtatious. With just a few quick layers, I could get a subtle bend without a lash curler and have a naturally glamorous look. Many thickening formulas run the risk of giving your tarantula eyes, but not Living Nature’s; it gently coats and builds the lashes without clumping or sticking together. I tried this mascara in “Midnight,” the edyy, inky blue, and absolutely loved it. (It’s also available in black and brown!) I’m not sure what it is about colored mascara, but it gave so much depth to my brown eyes. Besides the color, though, formula of Mineral Fusion’s Volumizing Mascara is everything my lashes need: Not too “wet” of a formula (stick-straight lashes can’t handle that), and a big-but-not-too-big brush to deposit as much mascara as possible onto every lash. I will say that this formula dries very quickly, so be sure to brush on your two or three coats quickly after curling. With that said, this mascara held my lashes’ curl so well and gave it the thickness and fullness it promised! To be honest, I didn’t have very high hopes for Pacifica’s Stellar Gaze Length & Strength Mineral Mascara when I got it in a recent Goodebox. However, I was pleasantly surprised. This coconut oil-infused natural mascara didn’t run or flake on me, and I found that because the formula is a bit drier, it helped hold the curl in my stick-straight lashes while defining and lengthening every last one of them. The thickness and volume of my lashes with this mascara wasn’t va-va-voom, but it wasn’t paltry, either; it’s actually pretty comparable to Tarte’s performance! As noted in this makeup of the day post, Perfekt’s Lash Perfection Gel has a medium-sized brush that’s brilliant at coating each and every lash with the perfect amount of mascara that helps you achieve both length and thickness. I’ve heard a lot of hype around Studio 78 Paris’ “We Flirt Around: Double Effect Mascara,” and it’s for good reason — it works! Marissa at BeauTeaBar sent me a sample to try, and while I’m always a skeptic, I was wowed by the performance of this natural mascara. It’s not too wet and not too try; this is another one that’s very comparable to Tarte and is almost a hybrid of Tarte and BareMinerals — but with way chicer packaging. It held my curl and didn’t flake or smudge on me. Hello for another win! It was only by chance that I tried this mascara, as it was a free gift with purchase of another Tarte product, but I’m so thankful I got it. It’s a fantastic volumizing, lash-blackening mascara that is said to increase lash volume by 406 percent! I don’t do crazy math like that, but what I can report is that this mascara delivered in the va-va-voom department and didn’t flake on me at all. I may even dare to say that I like it better than my go-to Lights, Camera, Lashes, especially because the cool wooden packaging and wand are easy to hold and look nice in my cosmetics bag. Tarte, you have my heart! I’ve repurchased Tarte’s Lights, Cameras, Lashes 4-in-1 Mascara several times; it’s my go-to when I’m frustrated by the natural mascara hunt. You can see me wearing it in this makeup of the day post, but I’ll go ahead and tell you again that this is a staple because of the lengthening, curling, defining and thickening it offers. What are some of your favorite natural mascaras? What do you look for in a great natural mascara? What picks in my “will not repurchase” list are on YOUR repurchase list? Tell me in the comments section!